The renovation of Dramedtse Lhakhang in Monggar is nearing completion. 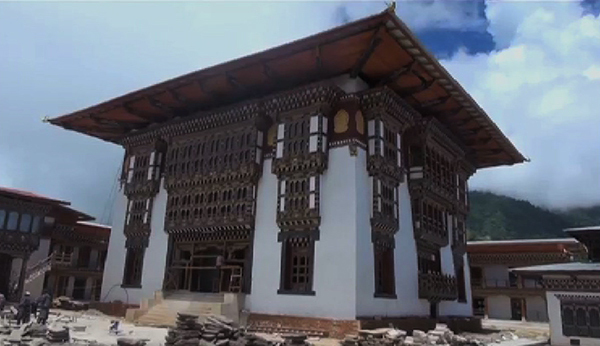 With over 90 per cent of the works already complete, the centuries-old lhakhang is expected to be restored by October. All major work components are over. The project is now carrying out minor masonry and carpentry works. The restoration works began in 2015 following the command of His Majesty The King. The three-storey monastery was damaged by an earthquake in 2009. The Dzongkhag Project Engineer, Thinley Wangchuk, says no major changes have been made to the traditional architecture of the monastery. The monastery is now earthquake resistant and will have fire hydrants installed. Hostels, classrooms and, conference and dining halls for the monks have been constructed as part of the project. The Dramedtse Lhakhang was built in the 16th century under the command of Ani Choten Zangmo, the granddaughter of Terton Pema Lingpa. Currently, Sungtruel Rinpoche, who is believed to be the incarnation of Pema Lingpa, heads the monastery. There are over 150 monks studying at the monastery.